We take the results of our company analysis combined with calculations on your Portfolios performance and diversification to produce an easy to understand infographic. What Snowflake shape does your Portfolio have? A Portfolio Snowflake is the weighted average of the company Snowflakes within the Portfolio. 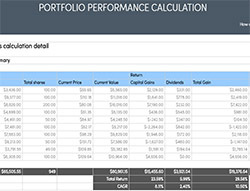 It allows you to see what kind of Portfolio you have and how it can be improved. What makes up the Portfolio? An overview of all companies that make up your Portfolio including their returns. You can sort based a range of factors such as Snowflake shape or Returns. How much has your Portfolio returned? We breakdown your returns into capital gain and dividends. We also provide you with a detailed calculation report which includes dividend payments and stock splits. See an example performance calculation. Are you too focused on one industry? Investing heavily in any one company or industry can be dangerous. We visualize both to help you build a well-diversified Portfolio. We can analyze the value of a Portfolio in the same way as a stock. To do this we use the results of our discounted cash flow calculation on each individual stock to come up with a ‘Free Cash Flow’ value of your Portfolio. We also calculate the PE, PEG and PB ratios and compare them to the market averages. How much will your Portfolio grow next year? We take the expected growth in earnings of the individual companies to calculate how much your Portfolio is expected to grow next year and three years. Clicking any of the blue links will build a custom Grid view based around your Portfolio. Learn how you can easily import a Portfolio by uploading a file (.csv) from your broker, by copying and pasting from Excel, or by clicking 'Add' on any company in Simply Wall St. This makes creating a Portfolio a 2 minute job and makes it possible to import a large number of transactions.